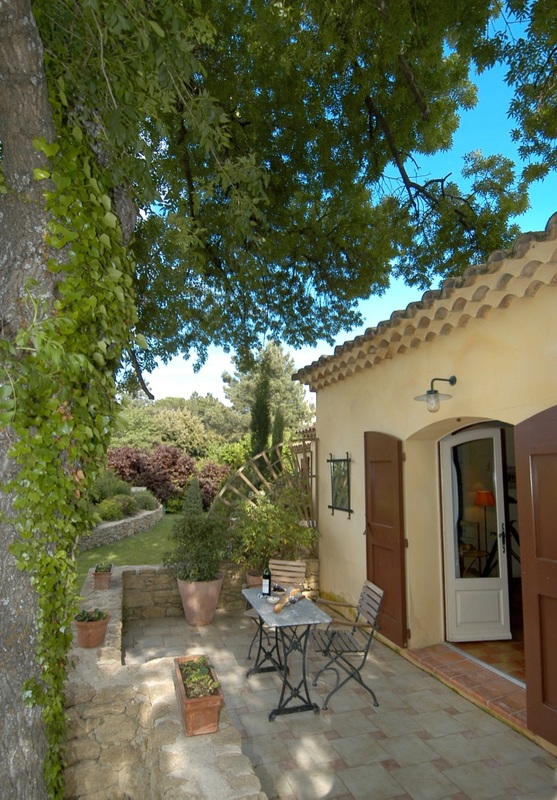 Be the first to know about what's going on at Les Olivettes! 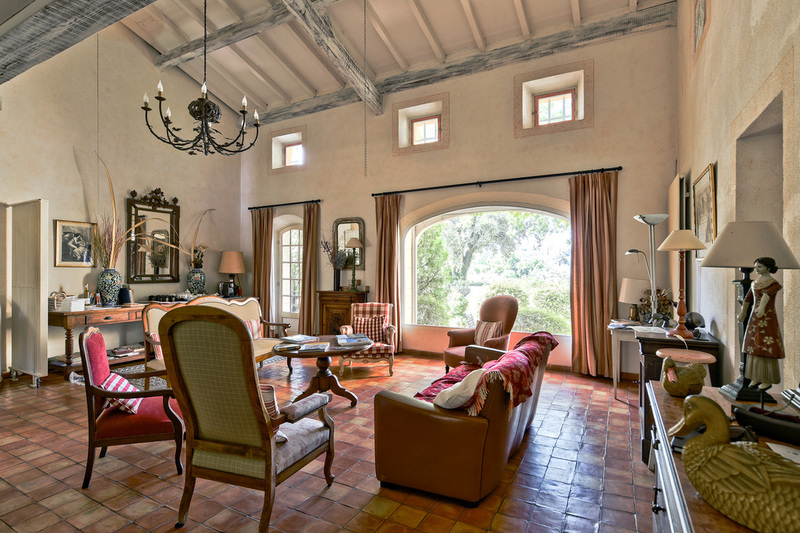 Decorated and furnished with the help of a professional interior designer, the inside of this Provencal farmhouse has a spacious living/dining room, a well-equipped kitchen and four double suites, each with distinctive colours, and its own character and decor, inspired by the traditions of Provence. 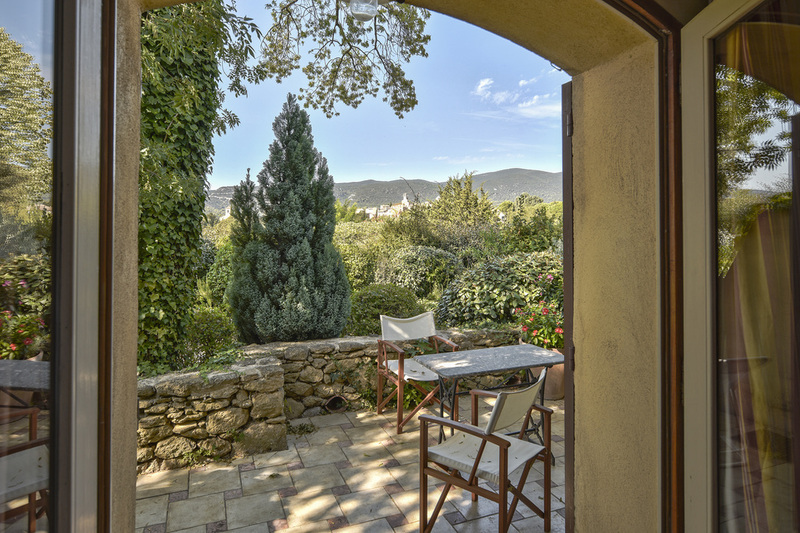 nbsp]Outside there are extensive flower gardens, olive groves and a 14m x6.5m (46' x 21') landscaped swimming pool. Our guests have found that the lay-out and sense of space make the whole house ideal for a family or a group of friends who wish to stay under the same roof but still have a certain amount of independence. 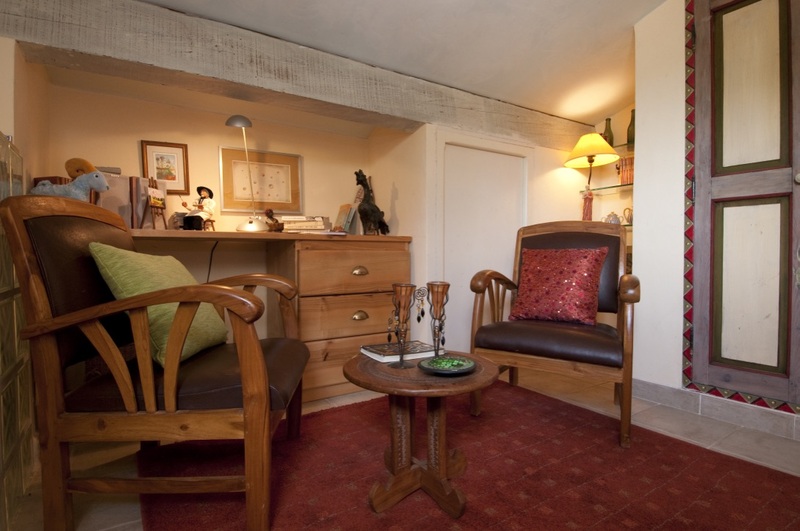 During selected weeks, we rent out the individual suites separately; each one is self-contained and equipped for self-catering. Each of our suites has its own style and colorways, and all four are welcoming and comfortable. “Le Pastis” is decorated in subtle shades of green and cream. 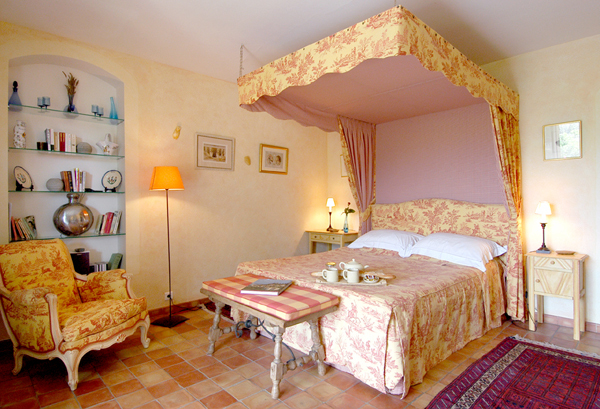 It is light-filled, with a four-poster bed, a seating area and a shaded terrace looking out onto a fountain and the Chateau. There is a fully-tiled bathroom with tub and shower, and a separate lavatory. “Pastis” is the emblematic aniseed drink of summer in Provence. “Le Genet” is painted in warm hues of yellow and ochre. 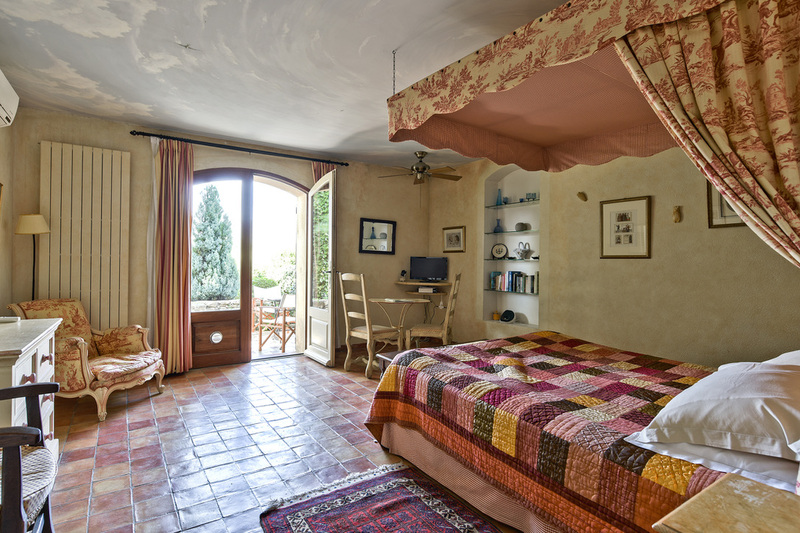 It has a canopied bed, magnificent views from the bed and the terrace of the Chateau and the hills beyond, a comfortable seating area and antique cupboard doors. The bathroom is fully-tiled, with a handmade marble surround to the washbasin, and an oversized shower stall. “Genet” is the French word for the bush we call broom, whose yellow flowers perfume the Provencal air in summer. 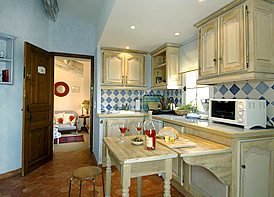 “Le Voltaire” is a one-bedroom suite above “Le Pastis”. 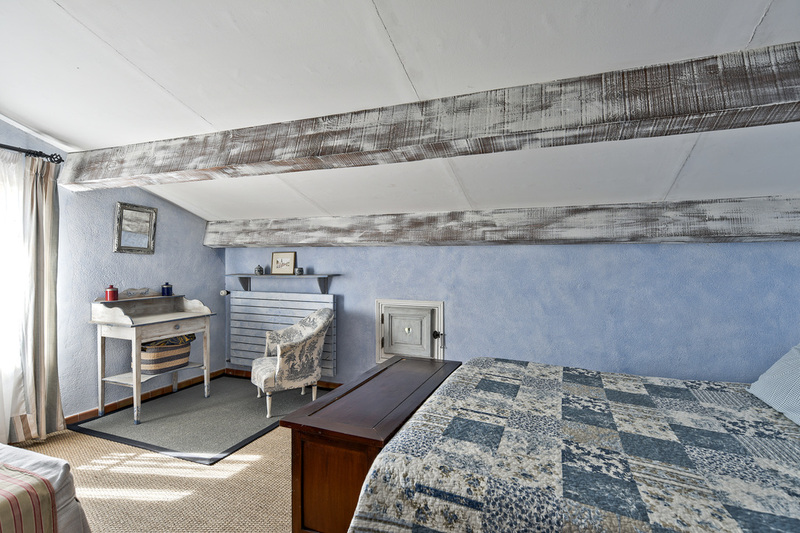 It is decorated in soft hues of blue and lavender, and has a quaint sloping ceiling in the bedroom. 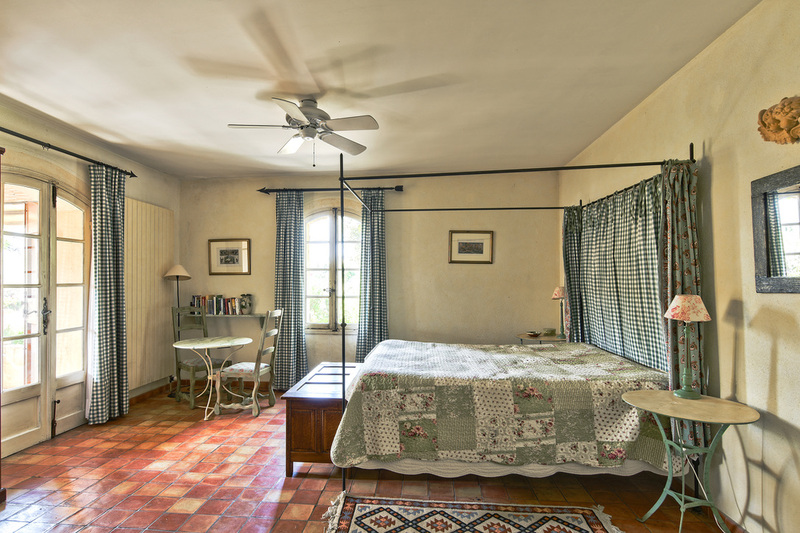 There is a folding single bed for a third guest. The bathroom has a large shower stall. There is additional space outside the suite on a private mezzanine, which gives onto a furnished south-facing balcony. “Voltaire”, is well, Voltaire. “La Zidane” is quirky and wonderful. 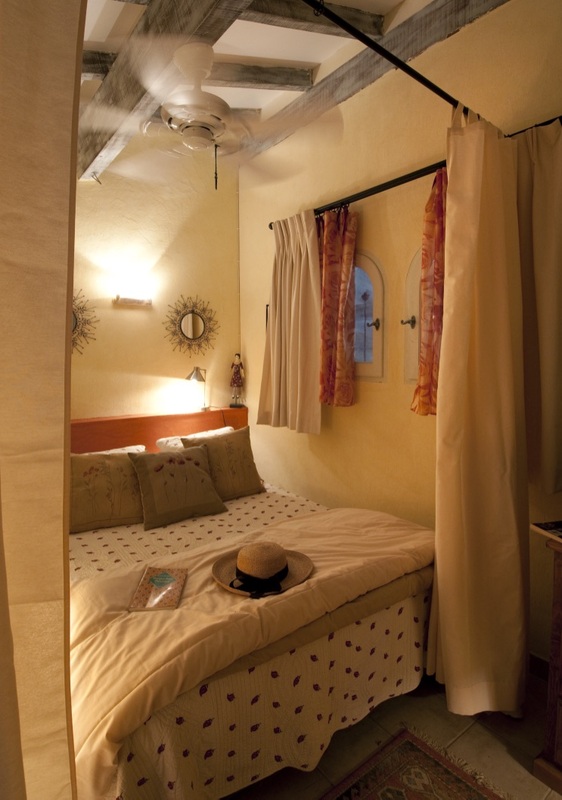 It is upstairs, and there is a small double bedroom, a good-sized bathroom with shower, and a comfy seating area inside. 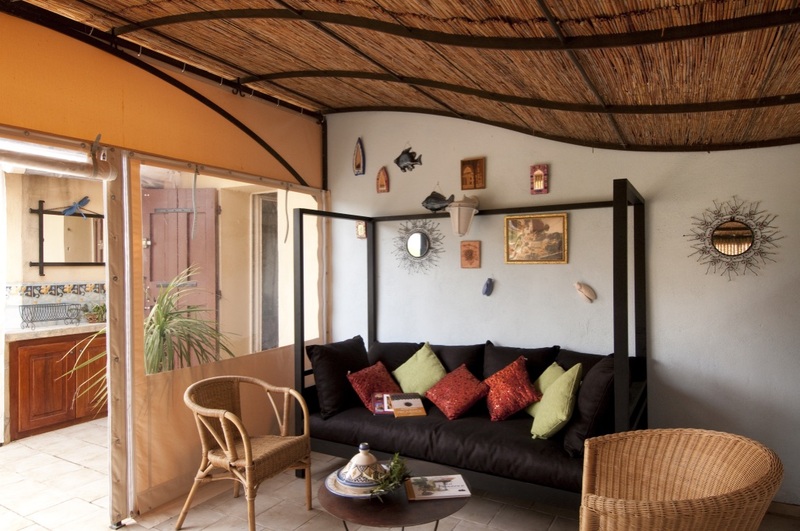 The best part is outside on the huge, indoor-outdoor terrace, where you can sit in shade or in sun, cook, eat, hang-out. The covered and enclosed part of the terrace has a canopied sofa, which is also a single bed, as well as a large dining table. “Zidane” is named after a local hero, Zinédine Zidane, captain of the French football team which won the World Cup in 1998. 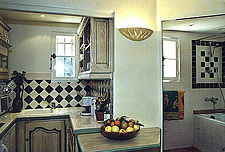 The suite is decorated with references to his North African origins. 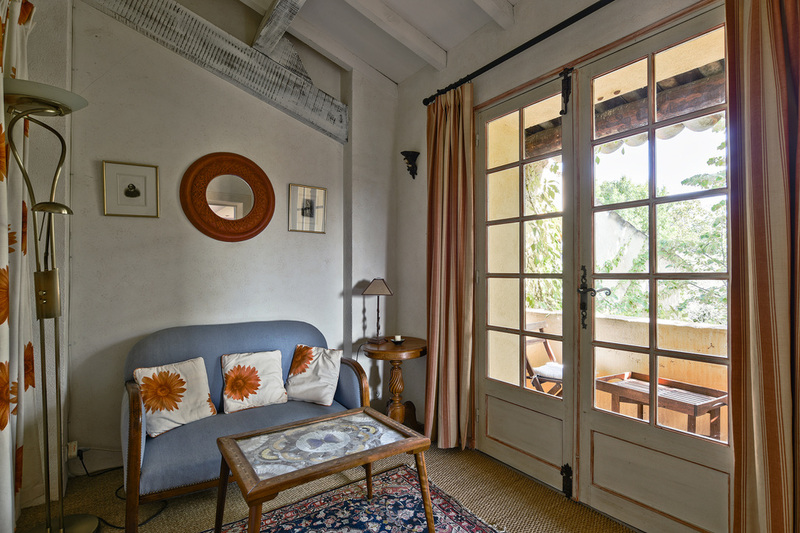 Each suite has a private shaded terrace or balcony, in the case of “Le Voltaire”, with furniture for dining and relaxing, and a small but functional kitchenette with fridge, cooking rings, counter-top oven and utensils. Copyright 2019 Les Olivettes. ALL RIGHTS RESERVED.